Your vehicle’s water pump is an important component of your cooling system. Located in the engine compartment, the sole responsibility of the water pump is to prevent the engine from overheating. Using an impeller (a rotating device similar to a fan), the water pump moves coolant fluid and water throughout your vehicle’s entire cooling system. This prevents your vehicle from over heating. When your water pump fails to work correctly, it means that coolant isn’t circulating, which can then cause your engine to overheat. Park your vehicle on a clean surface, or place a light colored piece of paper or cardboard underneath your vehicle’s engine area. If you notice green, yellow, or red fluid, you’ll definitely want to have your vehicle looked at by a professional. Keep in mind that the leak may also be linked to a faulty radiator hose, or some other problem within your cooling system. If you notice that you’re experiencing problems with your engine overheating, it may be due to a worn or problematic water pump. If your vehicle’s temperature warning light comes on, it may be due to a malfunctioning water pump. If you’re driving, and your engine overheats, it may cause your car to shut off. You won’t be able to start your car up again until the engine has cooled. If you notice a grinding sound coming from your engine, it may be because the water pump pulley is loose or worn. If this is the case, the water pump won’t be able to circulate coolant, and your engine will overheat. Only have a professional auto technician inspect and change your water pump pulley. The following are some quick tips to help prevent bigger issues in the future. Water pumps are designed to last a long time. However, if you do have to replace your water pump, also be sure to have your thermostat replaced as well. Have your cooling system inspected by a professional. At USA Automotive, our auto technicians are ASE certified, and we have the tools, knowledge, and experience to effectively deal with any issues that arise. Sometimes, the issue may not have anything to do with your water pump. It may actually be a faulty/bad serpentine drive belt that needs to be replaced or repaired. 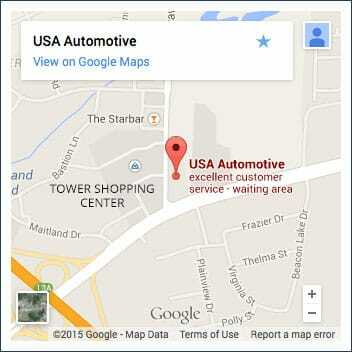 Call USA Automotive today at 919-249-5295 or use our online appointment request form. We look forward to providing you with the best water pump replacement in the Raleigh, NC area!